… I am credited with being one of the hardest workers and perhaps I am, if thought is the equivalent of labor, for I have devoted to it almost all of my waking hours. But if work is interpreted to be a definite performance in a specified time according to a rigid rule, then I may be the worst of idlers. Every effort under compulsion demands a sacrifice of life-energy. I never paid such a price. On the contrary, I have thrived on my thoughts. I sleep about one and one-half hours a night. I think that is enough for any man. … There are so many things to do I do not want to spend time sleeping needlessly. In my family all were poor sleepers. Time spent in sleep is lost time, we always felt. … In my boyhood I suffered from a peculiar affliction due to the appearance of images, often accompanied by strong flashes of light, which marred the sight of real objects and interfered with my thought and action. They were pictures of things and scenes which I had really seen, never of those I imagined. When a word was spoken to me the image of the object it designated would present itself vividly to my vision and sometimes I was quite unable to distinguish whether what I saw was tangible or not. This caused me great discomfort and anxiety. … Sometimes it would even remain fixt in space tho I pushed my hand thru it. Every night (and sometimes during the day), when alone, I would start on my [mental] journeys—see new places, cities and countries—live there, meet people and make friendships and acquaintances and, however unbelievable, it is a fact that they were just as dear to me as those in actual life and not a bit less intense in their manifestations. … I started by first picturing in my mind a direct-current machine, running it and following the changing flow of the currents in the armature. Then I would imagine an alternator and investigate the progresses taking place in a similar manner. Next I would visualize systems comprising motors and generators and operate them in various ways. In attacking the problem again, I almost regretted that the struggle was soon to end. I had so much energy to spare. … Back in the deep recesses of the brain was the solution, but I could net yet give it outward expression. As I uttered these inspiring words the idea came like a flash of lightening and in an instant the truth was revealed. I drew with a stick on the sand, the diagram shown six years later in my address before the American Institute of Electrical Engineers, and my companion understood them perfectly. The images I saw were wonderfully sharp and clear and had the solidity of metal and stone, so much so that I told him, “See my motor here; watch me reverse it.” … A thousand secrets of nature which I might have stumbled upon accidentally, I would have given for that one which I had wrested from her against all odds and at the peril of my existence..
… I finally had the satisfaction of seeing the rotation effected by alternating currents of different phase, and without sliding contacts or commutator, as I had conceived a year before. It was an exquisite pleasure but not to compare with the delirium of joy following the first revelation. … The practical result of this was the art of telautomatics which has been so far carried out only in an imperfect manner. Its latent possibilities will, however, be eventually shown. I have been since years planning self-controlled automata and believe that mechanisms can be produced which will act as if possest of reason, to a limited degree, and will create a revolution in many commercial and industrial departments. [W]hatever our resources:of primary energy may be in the future, we must, to be rational, obtain it without consumption of any material. Long ago I came to this conclusion, and to arrive at this result only two ways … appeared possible—either to turn to use the energy of the sun stored in the ambient medium, or to transmit, through the medium, the sun’s energy to distant places from some locality where it was obtainable without consumption of material. ‘If we were to release the energy of atoms or discover some other way of developing cheap and unlimited power at any point on the globe, this accomplishment, instead of being a blessing, might bring disaster to mankind in giving rise to dissension and anarchy, which would ultimately result in the enthronement of the hated regime of force. [T]o burn coal, however efficiently … would be … a phase in the evolution toward something much more perfect. After all, in generating electricity in this manner, we should be destroying material, and this would be a barbarous process. We ought to be able to obtain the energy we need without consumption of material. … The man who should stop this senseless waste would be a great benefactor of humanity, though the solution he would offer could not be a permanent one, since it would ultimately lead to the exhaustion of the store of material. A far better way, however, to obtain power would be to avail ourselves of the sun’s rays, which beat the earth incessantly and supply energy at a maximum rate of over four million horsepower per square mile. … [A]n inexhaustible source of power would be opened up by the discovery of some efficient method of utilizing the energy of the rays. Another way of getting motive power from the medium without consuming any material would be to utilize the heat contained in the earth, the water, or the air for driving an engine. It is a well-known fact that the interior portions of the globe are very hot, the temperature rising, as observations show, with the approach to the center at the rate of approximately 1 degree C. for every hundred feet of depth. The difficulties of sinking shafts and placing boilers at depths of, say, twelve thousand feet, corresponding to an increase in temperature of about 120 degrees C., are not insuperable, and we could certainly avail ourselves in this way of the internal heat of the globe. The windmill, the solar engine, the engine driven by terrestrial heat, had their limitations in the amount of power obtainable. Some new way had to be discovered which would enable us to get more energy. There was enough heat-energy in the medium, but only a small part of it was available for the operation of an engine in the ways then known. Besides, the energy was obtainable only at a very slow rate. Clearly, then, the problem was to discover some new method which would make it possible both to utilize more of the heat-energy of the medium and also to draw it away from the same at a more rapid rate. 1. 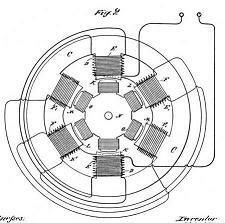 The ‘Tesla Transformer.’ This apparatus is in the production of electrical vibrations as revolutionary as gunpowder was in warfare. Currents many times stronger than any ever generated in the usual ways, and sparks over one hundred feet long, have been produced by the inventor with an instrument of this kind. 2. 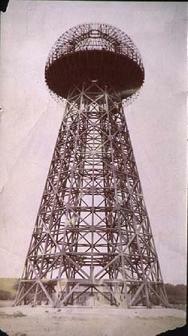 The ‘Magnifying Transmitter.’ This is Tesla’s best invention, a peculiar transformer specially adapted to excite the Earth, which is in the transmission of electrical energy what the telescope is in astronomical observation. By the use of this marvelous device he has already set up electrical movements of greater intensity than those of lightning and passed a current, sufficient to light more than two hundred incandescent lamps, around the Globe. 3. The ‘Tesla Wireless System.’ This system comprises a number of improvements and is the only means known for transmitting economically electrical energy to a distance without wires. Careful tests and measurements in connection with an experimental station of great activity, erected by the inventor in Colorado, have demonstrated that power in any desired amount can be conveyed, clear across the Globe if necessary, with a loss not exceeding a few per cent. 4. The ‘Art of Individualization.’ This invention of Tesla’s is to primitive ‘tuning’ what refined language is to unarticulated expression. It makes possible the transmission of signals or messages absolutely secret and exclusive both in the active and passive aspect, that is, non-interfering as well as non-interferable. Each signal is like an individual of unmistakable identity and there is virtually no limit to the number of stations or instruments which can be simultaneously operated without the slightest mutual disturbance. 5. ‘The Terrestrial Stationary Waves.’ This wonderful discovery, popularly explained, means that the Earth is responsive to electrical vibrations of definite pitch just as a tuning fork to certain waves of sound. These particular electrical vibrations, capable of powerfully exciting the Globe, lend themselves to innumerable uses of great importance commercially and in many other respects. I have just uploaded a very interesting video on the Secrets of Nikola Tesla to my blog that you and your readers may find to be of interest.